Beautifully engraved certificate from the Pennsylvania Salt Manufacturing Company issued from 1876 to 1888. This historic document has an ornate border around it with a vignette of an eagle holding an olive branch and a shield. This item is hand signed by the company’s president and treasurer and is over 118 years old. ATOFINA Chemicals, Inc., was formed in June 2000 following the merger of TotalFina and Elf Aquitaine. ATOFINA Chemicals was formerly Elf Atochem North America, which was formed at the end of 1989 through the merger of Atochem, Inc., M&T Chemicals, Inc., and Pennwalt Corporation. From 1989 to the end of 1991 the company was known as Atochem North America, Inc. From 1992 to 2000 it was known as Elf Atochem North America, Inc. Atochem, Inc., a manufacturer of industrial and specialty chemicals, was formed in 1984 as the U.S. chemicals unit of Elf Aquitaine, one of the world's top 10 oil and gas companies. M&T Chemicals was founded in 1908 as Goldschmidt Detinning Company and became Metals and Thermit Corporation in 1918. 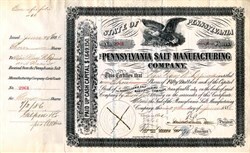 Pennwalt, a publicly-held chemical manufacturer, was started by an enterprising group of Quaker businessmen in 1850 as the Pennsylvania Salt Manufacturing Company, producing lye and other alkaline salts from natural salts.